All you need to know about the God of the Air! From the corner of your eye you spot a shimmer of iridescence from blue-violet to green-gold high up in the canopies. There are deep, smooth, slurred melodies in simple patterns echoing through the dense cloud forest. What a special moment – you have spotted the precious Resplendent Quetzal! Many avid birders consider the Resplendent Quetzal the glittering crown jewel of birding in Costa Rica and Central America. This magnificent bird, also known as Pharomachrus mocinno, belongs to the Trogan family and counts 6 species as members over all: the Crested, the Golden-headed, the White-tipped, the Pavonine, the Eared and of course the Resplendent Quetzal. You can find the Resplendent Quetzal from Southern Mexico all the way down to western Panama, where it lives in moist tropical forests in mountainous regions. This bird is most active in canopies and edges. We will help you spotting one in Costa Rica! Quetzal feathers are beautiful to look at and photograph. Males have a bright green plumage with a brilliant red breast, white tail feathers and elongated upper tail coverts. They truly are the most ornate and spectacular of the Trogons and can grow up to 25 inches / 65 cm. Females are more like other trogons, with less iridescence, a grey-brown breast and a barred tail, which lacks the elongated streamers. The overall body length without the males long tail feathers is about 14 – 16 inches / 36 to 40 cm. Quetzals weigh between 7 – 8 ounces / 200 – 225 grams. Eating mostly fruits of the avocado family, which they pluck in flight, the Resplendent Quetzal is a true omnivore as it also devours insects, lizards, frogs and other small animals. During the breeding season the males attract attention by their loud calls and spectacular display flight high above the canopy. Quetzals breed in cloud forests, but move to lower altitudes for part of the year.” To build nests in stumps or rotted trees Quetzals use their strong beaks. They take turns incubating up to three eggs. Young Resplendent Quetzals start to fly at about three weeks of age, although male birds only grow their long tail streamers after about three years. When not attacked and killed by its main predators, the gray squirrel, hawks and owls, the Quetzal can live 20 to 25 years. Bird watchers from all over the world come to spot the Resplendent Quetzal in Costa Rica. Most likely seen in Costa Rica’s central highlands at Poas, Monteverde and in San Gerardo de Dota around the Cerro de la Muerte. So where can you observe this beautiful, yet somewhat mysterious creature? Look no further than the valley of San Gerardo de Dota in Costa Rica’s central highlands. It is one of the country’s most famous birding hotspots. The region’s cloud forests are covered in wild avocado trees, the quetzal’s favorite food. December through May is the best time to see them, but some travelers have luck during other months of the year. In Monteverde, the quetzal is most frequently observed from March through June, during its mating season. While it’s true that the resplendent quetzal can be elusive, you are bound to have luck with the help of a local birding guide. Especially if your timing is right. Most guides carry a spotting scope for close-up views of the birds, so keep in mind that small digital cameras are great for photographing through the scopes. Look for quetzals and other high-altitude avian species in the wonderful Costa Rican parks and reserves. There are also many great Birding Lodges throughout Costa Rica from where you can start your Birding Adventure! The world’s interest in the quetzal dates back to pre-Columbian times. Here, both Mayan and Aztec cultures considered the species sacred, due to its unique beauty and relative inability to live in captivity. The Mayas believed the quetzal is the “god of the air” and a symbol of lightness and good. In many cultures it is considered a crime to kill the Quetzal. Even today, a glimpse of a wild resplendent quetzal feeding or simply perched in a tree can feel like a magical experience. Proclaimed a wise man and placed a jade necklace over the head of Cacique’s – a powerful Quiche leader – new born son. Chiruma, the jealous younger brother of Cacique wished the death upon Quetzal since he wanted to become the next leader himself. He tried to kill his nephew by several ways but each time he mysteriously failed. One day there was a battle between the Quiches and a neighboring tribe. Although many warriors died, every arrow just veered past Quetzal. That was when Chiruma realized that Quetzal’s necklace must be his protection. The next night, Chiruma snuck into Quetzal’s room, stole his necklace and wore it himself. Another day Chiruma surprised Quetzal in the forest and shot an arrow straight through his nephew’s heart. Quetzal fell to the ground dead and Chiruma would now be the new leader when his brother Cacique would die. Suddenly Quetzal’s chest began to throb and a beautiful bird emerged from out of his body. It had shimmering emerald wing feathers, a small yellow beak and a three-foot long tail with iridescent blue feathers. Singing with the most beautiful voice ever heard of any other bird before or since, it flew down towards the murderer and took the necklace up into the trees. As Chiruma looked in astonishment at the resplendent bird above, a jaguar leapt upon him killing him with one bite. Years later the Spaniards came and had a great battle with the Quiches. The fight brought many of the Mayans to grave, so a Quetzal bird landed on the Mayan ruler Tecun Uman. Trying to comfort the dying man, the bird landed on his body where it’s chest got stained by the blood. The Quetzal is the national bird of Guatemala, where it is also the name giver to the Guatemalan currency. 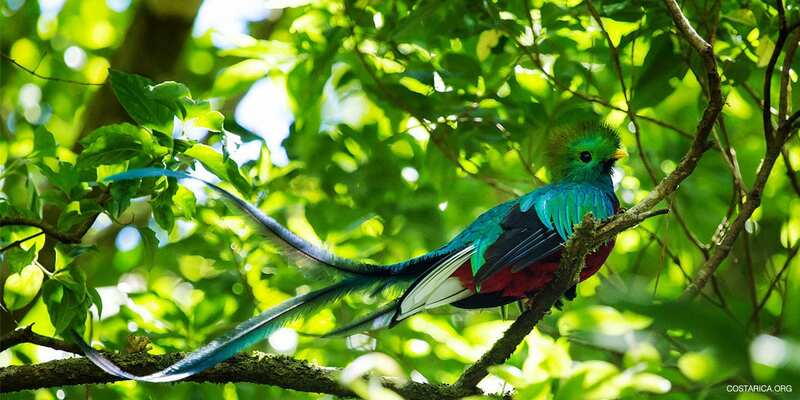 Their name comes from the Aztec word ‘quetzalli’ meaning precious or beautiful – we can definitely see why! It was the Mayas who also believed the Quetzal as the “god of the air” and a symbol of lightness. In many cultures it is a crime to kill a Resplendent Quetzal. Due to the continued destruction of their cloud forest habitat, these beautiful birds are now threatened in Guatemala and elsewhere throughout their range. The IUCN listed them as ‘Near Threatened’ by IUCN. Some say, that since the Resplendent Quetzal does not reproduce in captivity, it will “kill itself” soon after being caged or captured. That is one of the reasons the Quetzal became a symbol of liberty in several cultures. It does seem very freedom loving, don’t you think so? Interested in Quetzals or other birds of Costa Rica? Get an overview of the best birding areas! Ediciones Jadine: Susan C.L.Fogden. A photographic guide to Birds of Costa Rica. San José, 2014.